Lopez Museum and Library usually bring out the object from their collections whether their Luna’s or Hidalgo’s that highlight the portion of it with the theme. So, this year, they focus on sketches of Hidalgo that usually you don’t get to see sketches that are meant to be only knew by the artists either for an experiment or a bigger mural. This time around, they bring some sketches and novenas from the 20th century and invited the three guest artists to react from those objects with the themes. What happens when art and art-making are interrupted? Is an unfinished work still worthy of display? Why would a work with no perfunctory conclusion deserve a second look? Open Ends, the second exhibition offering of the Lopez Museum and Library for 2015, highlights a collection of rarely seen studies, sketches, and unfinished paintings by Felix Resurreccion Hidalgo. These works are a segment of the collection that will resurface after more than a decade-long hiatus – well-kept and in storage. Often overshadowed by the higher-profiled Juan Luna, Hidalgo’s works reflect his quieter temperament, of an artist that is often only spoken of when referring to the tandem. Their contribution to Philippine Art is more than the laurels and distinctions they garnered in the historic Exposition win in 1884. 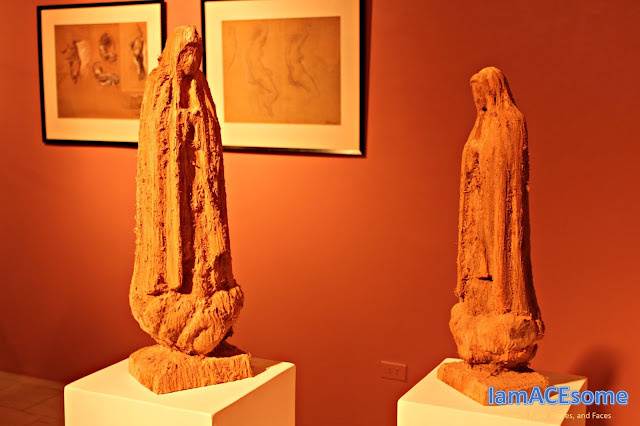 Hidalgo and Luna were at the forefront of the development of Filipino nationhood and it was through their art that they attempted to make sense of this personal and higher struggle. 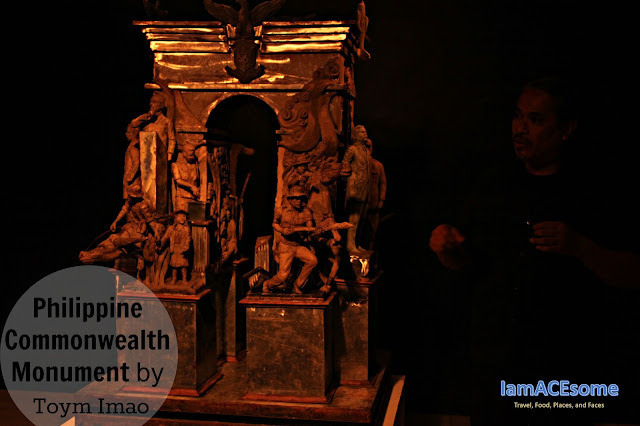 Anchored on Hidalgo’s pieces, contemporary artist Ling Quisumbing Ramilo assembled an archive of her own practice and collections to pose an analogy of methods. Experimentations with the material, selections of unresolved ideas, works in progress and residues of exhibitions carefully mapped out to create a discursive juxtaposition. 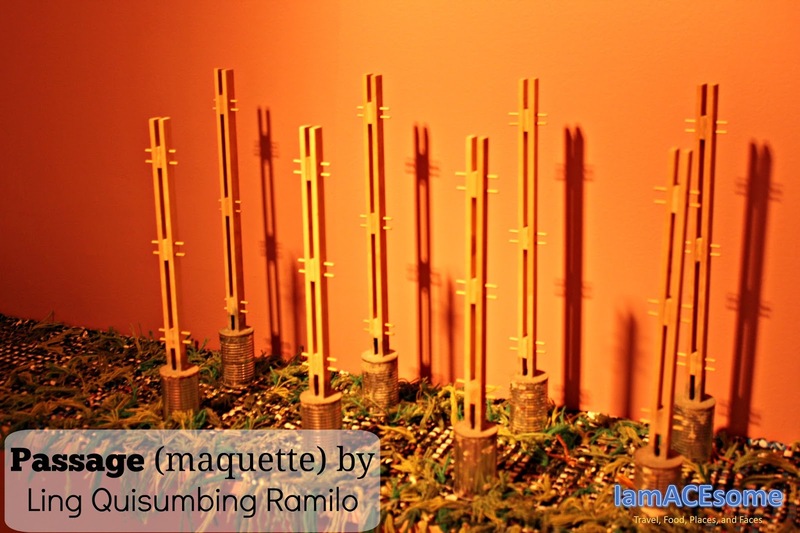 Who is Ling Quisumbing Ramilo? 1. Graduated from the University of the Philippines with a Bachelor’s degree in Visual Communications, majoring in Editorial Design and Illustration. 2. Received her Master of Arts degree in Studio Art and Art Education, majoring in Painting from New York University. 3. 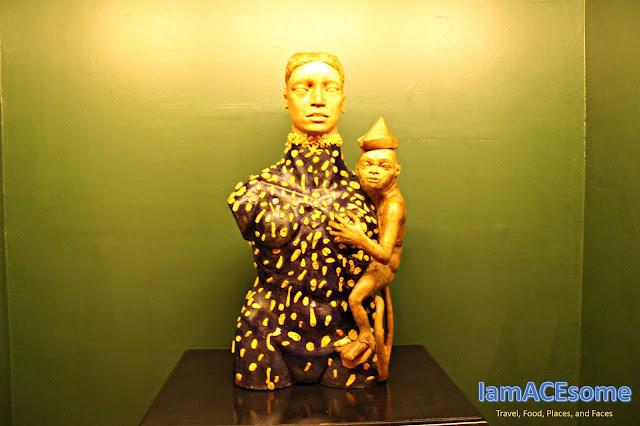 She has had several solo exhibitions in various galleries in Manila. 4. 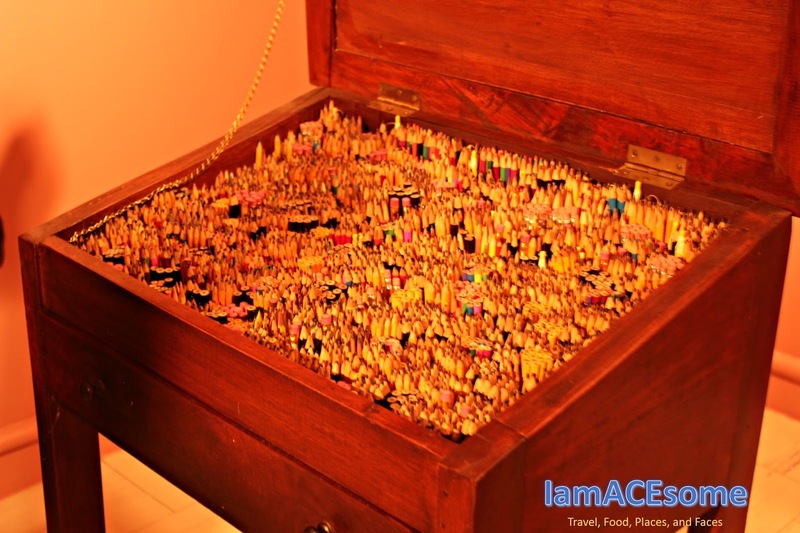 She took part in Art Stage Singapore 2014 and 2015, as well as the Philippine delegation for the 26th Asian International Art Exhibition (2011, Hangaram Museum in Seoul, Korea). 5. In 2009, she undertook an artist-in-residence program at Tembi Contemporary, Yogyakarta, Indonesia, in partnership with Valentine Willie Fine Art and received video grants from the Astraea Foundation in New York in 1997 and 1999. 6. She teaches at the University of the Philippines. A major piece is the architectural plan and maquette of Passage, a public installation at the University of the Philippines, Diliman. Ramilo reconstructed the recently demolished covered walkway of the university’s Main Library, which was also the Fine Arts and Architecture students’ hang out the place from the 1960s to 1990s. These colleges eventually relocated to separate areas in the campus. The architectural blueprint is cased in an intricately ornate frame. The maquette on the other hand is on a shelf with stilts. It is situated on top of linked trapos (woven rugs/mats), with sewn fibers of fine wool in varying shades of green mimicking overgrown grass and weeds that are on the site of the public installation. Toym Imao features his own maquettes of unrealized commissioned markers and monuments. An architecture graduate, he fuses his affinity for history and works these narratives into a unique visual perspective that are attempts in accuracy and creativity. 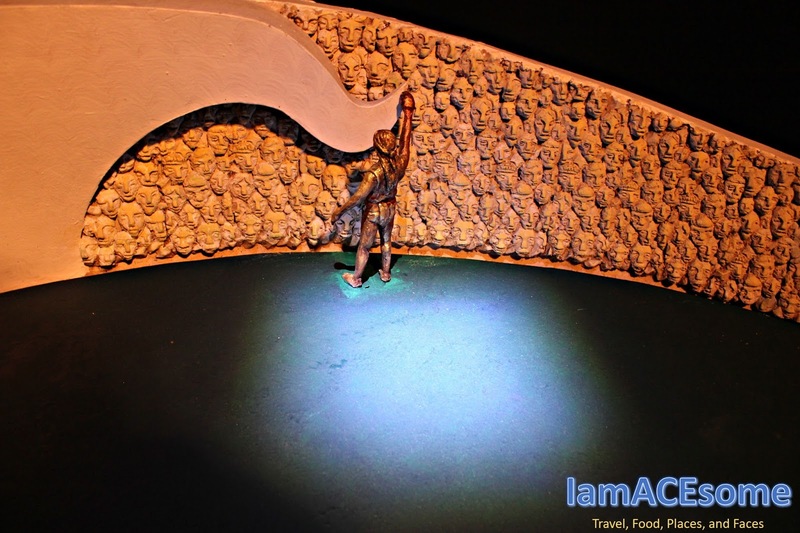 The supposed 11-meter structure is presented as a scale model of the Philippine Commonwealth Monument. Featuring key figures and turning points that defined the era of 1935 to 1946, it includes Manuel L. Quezon, Sergio Osmena, Manuel Roxas, Jose P. Laurel and Jose Abad Santos, among others. The model can be observed in the round and can be considered a summation of the Commonwealth, a transitional government for the Philippines before the attainment of full independence. 1. An architecture graduate from the University of the Philippines. 2. Received his MFA Major in Sculpture from the Maryland Institute College of Arts in Baltimore, Maryland. 4. He has shown in several galleries in Baltimore, Washington D.C., and New York. 5. He studied film under the multi-awarded director Marilou Diaz-Abaya. 6. He won the Best Production Design (New Breed) for his work in “K’na the Dreamweaver”. 7. 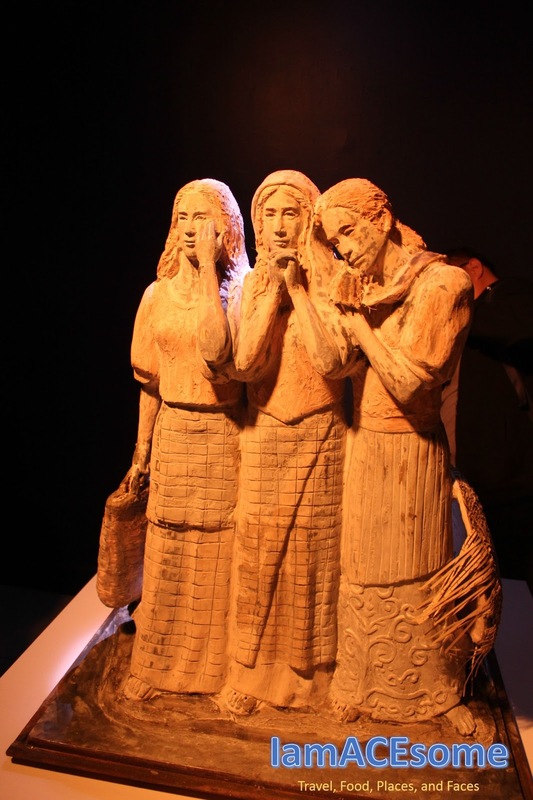 Other recognitions, Outstanding Campampangan Awardee for Sculpture (Pampanga, 2004), Gawad Parangal para sa Sining, sa Larangan ng Eskultura (Quezon City, 2010) and Gawad Patnubay ng Sining sa Kalinangan for Sculpture (Manila, 2012). 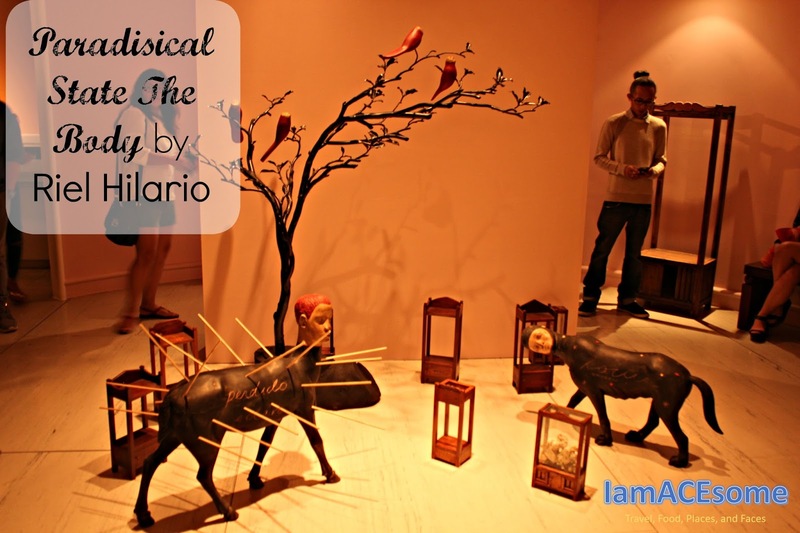 Straight through the hallway of the museum, the viewer will be greeted by Riel Hilario’s sculptural installation entitled It was a paradisical state: the body was allowed to be a body. 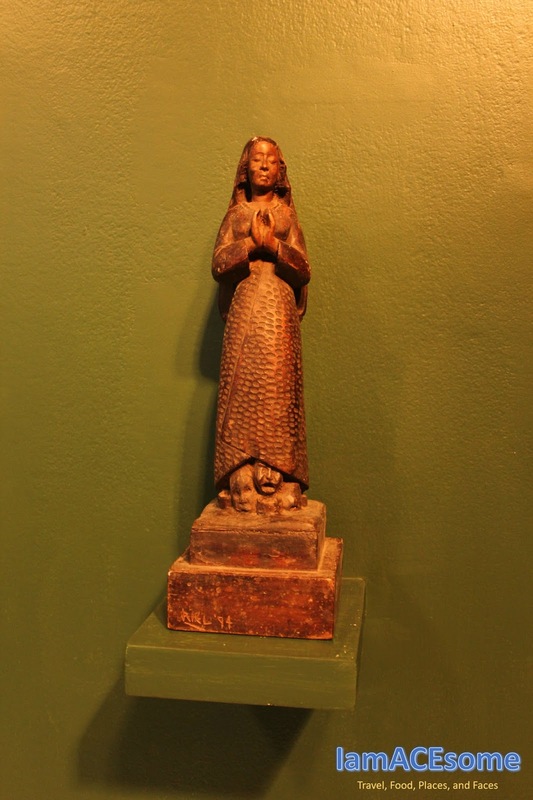 The work attests to the craftsmanship he got from his training in the art of santo-making and woodcarving, employed in creating a different brand of mysticism. 1. Completed his degree in Art History under the University of the Philippines. 2. His sculptures come from a recovery of ties to a tradition of wood carving while. 3. He has had several solo exhibitions in the Philippines (The Drawing Room and Art Informal, among others), New York, Singapore, and Paris. 4. He has participated in a number of group exhibitions in Germany, China, Singapore, London, Switzerland, and Indonesia. 5. Other recognitions, A 2013 Asian Cultural Council fellow, he has received other grants such as the Autumn Residency by the Cite des Artes Internationale (Paris, 2012), Swingspace Spring Residency by the Lower Manhattan Cultural Council and Residency Unlimited (New York, 2013). In 2012, he was one of the Cultural Center of Philippine’s Thirteen Artists Awardees and was named one of the winners of the Ateneo Art Awards and Philippine Art Awards. Canine bodies bear-human heads, winged creatures and cabinets make for a surreal scenario. Like a bandit, he would “smuggle images from his sleep” – from a place where complete and utter freedom reign. Disjointed characters that do not follow soundness or logic are put together for a strange gathering. Like his experimentation with the traditional art form, Hilario’s works are culled from different contexts and re-appropriated for this exhibition. Together with these contemporary works, pieces from the permanent collection of the Lopez Museum and Library are also integral to the show: Juan Luna’s iconic España y Filipinas, unfinished correspondences captured in Jose Rizal’s careful handwriting and beautifully bound and printed novenas or prayer booklets. In Open Ends, the works point to potential stages of artistic creation: to a seeming prologue of a story, experimentation in technique and even attempts at appeasing one’s curiosity. Challenging the usual practice of exhibiting an artist's best and finished works, the exhibition explores how value and meaning evolve by looking and experiencing art that are products of opportune moments, happy accidents and even (un)timely interruptions. 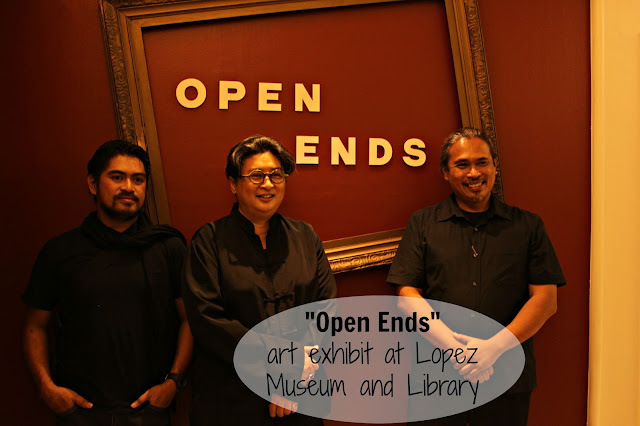 Open Ends is presented with support from Pacific Paint (Boysen) Philippines, Inc. The Public Programs for the exhibition is sponsored by Gourmet Farms Inc. The exhibition will run from August 22 to December 23, 2015. For more information, call Tina at 631 2417 or email lmmpasig@gmail.com. Lopez Museum and Library is located at the Ground Floor of Benpres Building, Exchange Road cor Meralco Avenue, Ortigas Center, Pasig City.